WOMEN Estimated Finish Time: 1:06 p.m.
MEN Start Time: 1:00 p.m.
MEN Estimated Finish Time: 3:42 p.m.
- Southbound off-ramp from Interstate 5 to Rye Canyon Road. This was the lake of my childhood. I fished and swam in this lake as a child with my brothers and friends. It was the place where my family rented summer cabins. At age four, I learned to ski at the local ski resorts. My parents later bought a share in a cabin at nearby Lake Arrowhead and we spent our summer weekends water-skiing and boating on that frigid lake. I can't wait to return to Big Bear, to combine memories and bike racing. 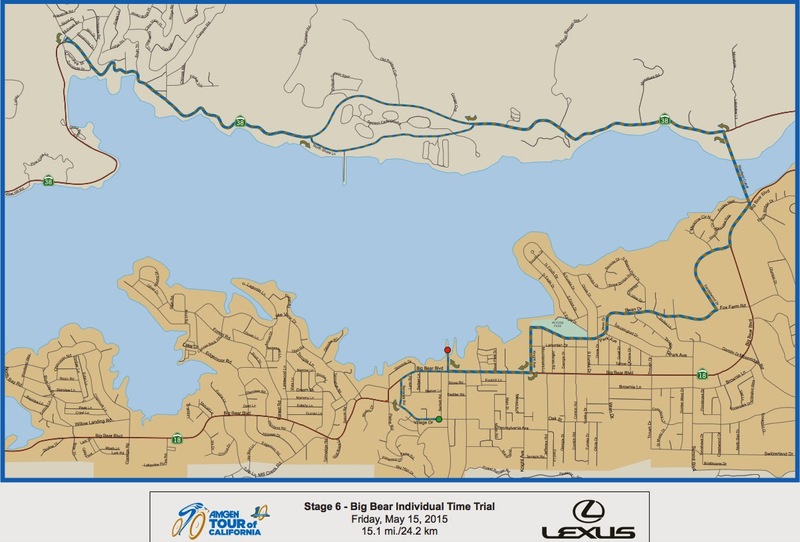 The individual effort given in the flat and fast Big Bear Time trial will indeed be a good day of bike racing and a highlight of this year's Tour of California. The overall winner may not be decided on Stage 6 in Big Bear, but the loser could be. There is more to loose than gain on a 15.1mile, 30-minute individual effort. The times of the Top 20 across the finish line at Pine Knot Marina Jetty will likely be very close. All that stands between an expected time and disappointment is an off day, a bad start, a shaky corner, a fall or a mechanical - and there goes your race with only two days remaining to battle back. And a very tough Mt Baldy scheduled for the next day. I do like the catchy name the locals came up with: Aero at Altitude. Big Bear is at 6,750ft. I live at 5280ft in Denver, so the altitude shouldn't shock me too much. The day at the lake on Friday, May 15th, should be an entertaining full day of people and bikes from 9am to 5pm. With a couple traffic jams thrown in for fun. Below I have compiled what I have learned about attending Stage 6 of the Amgen Tour of California at Big Bear Lake. 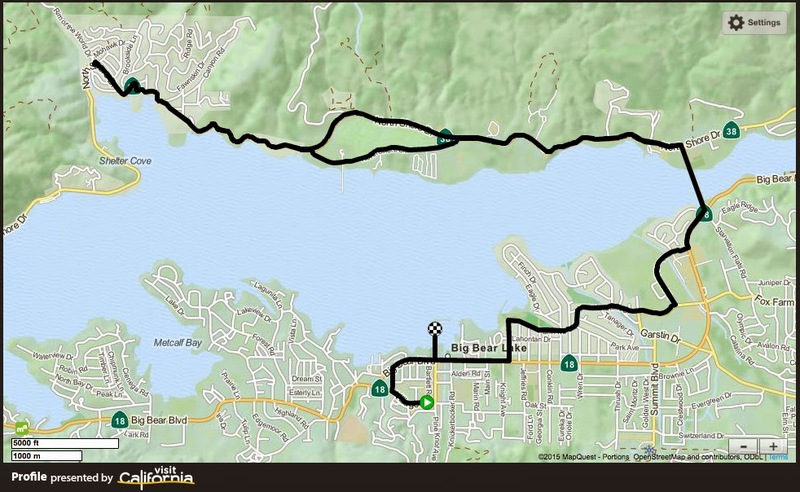 The ITT will begin in Big Bear Village. 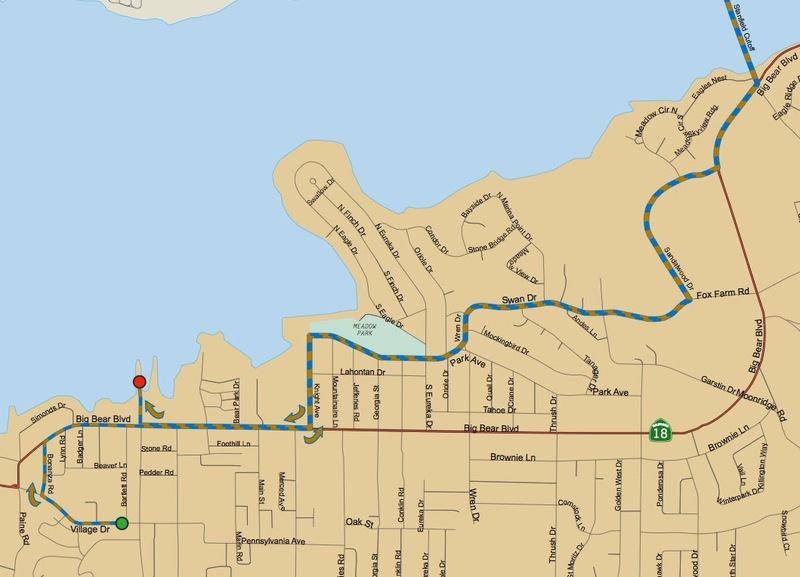 The riders will proceed along the shore and the Stanfield Cutoff across the lake to Fawnskin where they will turn around to retrace their route back into Big Bear to finish at the Marina Jetty. It will be a flat and fast course - rider times will be very close. Big Bear Lake: I fished and swam in this lake as a child, and learned to ski at the local resorts at age 4. I have fond memories of Big Bear. WOMEN Start Time: 11:00 a.m.
MEN Start Time: 12:47 p.m.
Tom Zirbel (Optum-Kelly Benefit Strategies) won the Redlands Bicycle Classic Stage 2 Time Trial this year in Big Bear, so his odds are very good. Tom is a power time trialer and this course suits him very well. Rhea Shaw (BMW p/b Happy Tooth Dental) won the women's time trial at the recent Redlands Bicycle Classic in Big Bear. Kristin Armstrong won the 2014 women's time trial of Amgen Tour of California, Amber Neben was second in 2014. All three women mentioned will be racing in this stage. The women's race is a sanctioned non-world cup UCI 1.1 designated race. The women will race on the same course as the men with equal prize money. The 2014 women's Individual Time Trial in Folsom, California, was won by Alison Powers; Brianna Walle took second and Tayler Wiles earned third. This year only Wiles is back on the roster to compete, but Kristin Armstrong will be racing. Aero at Altitude is what they are calling the race locally. Starting at the ski Village in Big Bear the race finishes in the Marina. Big Bear Time Trial Video promo. Park n' "Ride": Local organizers are encouraging spectators to bring their bicycles to ride into the village area. Valet bike parking will be available once you arrive. The starting order of riders for the men's race will be the reverse of the overall GC standings from the day before results from Stage 5 into Santa Clarita. The starting order (with racer, team and bib #) will be published the evening of May 14th. Race organizers expect the riders to take about 30-minutes to complete the full course. Their speed is estimated to be between 26 and 30 mph for the ITT. Almost the entire route is out and back, affording views of each racer passing twice. The team buses will be located near the start area along Bartlett Rd in the Village. You can see the riders warming up on their bike trainers pre race. Lots of fun to cruise the buses to see your favorite riders. The entire course will be fully closed to traffic. There will be designated pedestrian crossing points manned by volunteers who will open the crossing only when safe. Jumbo-tron screens will also be available in the Village and Lifestyle Expo areas to watch the race. The Expo and Beer Garden will be located along Pine Knot Ave. 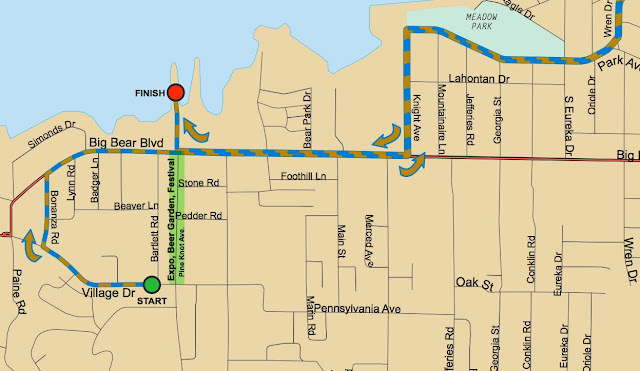 Fans will be able to walk back and forth between the start and finish along Pine Knot Ave. 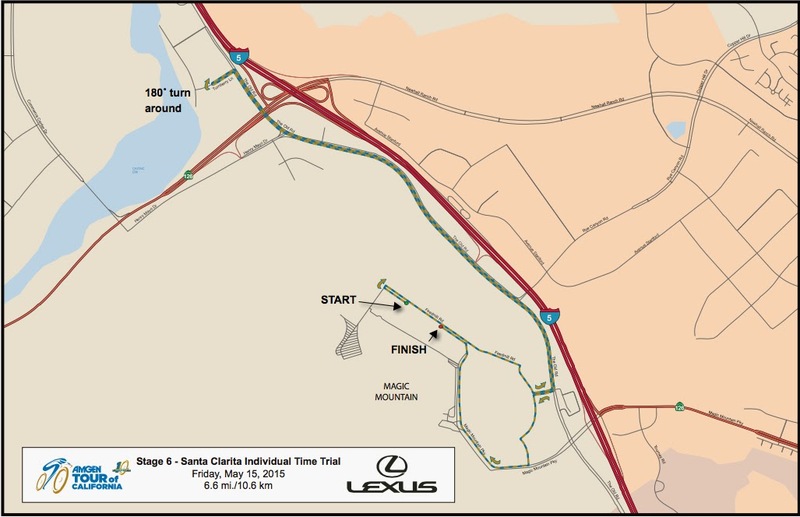 There will be a FREE bike valet at Robinhood Resort located between the start and finish at the corner of Big Bear Boulevard and Pine Knot Ave.
Big Bear has a unique opportunity for Bike Clubs to sign up for a 10x10 tent space near the Team Buses. Course-side viewing and picnicking can be found at Meadow Park (seen on the map below) where you will find picnic tables and a play area. Go early to reserve your spot. You can use the Alpine Pedal Path on the north side of the lake to get to prime scenic viewing spots. The Alpine Pedal Path is 3.2 miles one-way and stretches from the Stanfield Cutt-off to the Serrano Campground. The racers will first pass along the top of the campground on their way out to Fawnskin and return below the campground, on North Shore Lane, on their way back. Riders will make a 360-degree reversal of direction in the Fawnskin Triangle in the center of Fawnskin town. They will have to slow at the turns - which makes for good viewing. 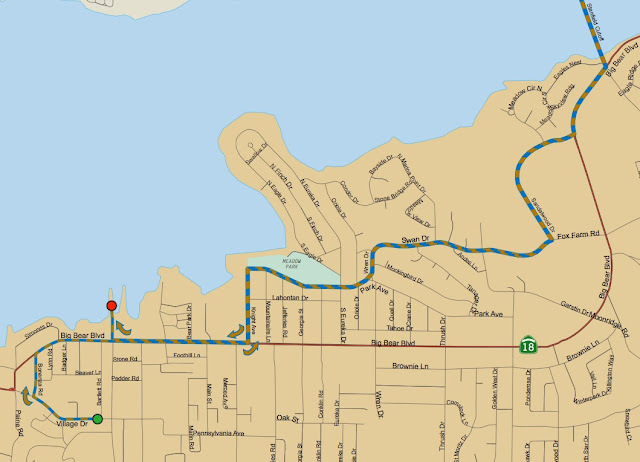 If you want to ride your bike to the end of the course in the neighborhood of Fawnskin, it is best to ride 8-miles west, around the lake, using Highway 18 west and then 38 north. Allow 45-60 minutes to navigate. Cars can access the turn-around in Fawnskin the same way - from the west on 38. Leave early to avoid traffic and find the best parking. The podium is at the end of the jetty. I print off the start list the night before so I can tell which rider is coming next (It will also be available for view on your phone on Tour Tracker). I always park where it will be easiest to exit/leave after the race. Parking should be most convenient for leaving the event, not for arriving at the event. I like to get their early so I can easily walk around and find all key locations. Where is the start ramp, the team buses, the finish line, the podium, and how can I easily get back and forth between these places. Next I take the time to grab a local coffee or snack. I people watch and soak in the atmosphere. I look at the course ahead of time to decide which side or corners will afford me good photos. I like to stop by the team buses to see the mechanics line up the bikes for the riders and check out the equipment each team will be using. I will watch from the barriers or meander through the Expo for the first group of riders. Chances are, the best time trialers will be in the middle of the start list or the last of the list. By the middle of the pack, I want to be at the team buses to watch these key riders warm up. Then I might be at the start ramp to sense their nervousness and see them take off. By the last 10 riders, I want to be near the finish where I can watch the times; and near the podium. You can meet Jens Voigt -- maybe. There is a waiting line to meet him. But try your best online, by watching a screen constantly refresh... and then ... I have no idea what will happen but it will take your billing information and let you know if you have a ticket. Buy your ticket to meet Jens. Emergency vehicles will not be affected by road closures. 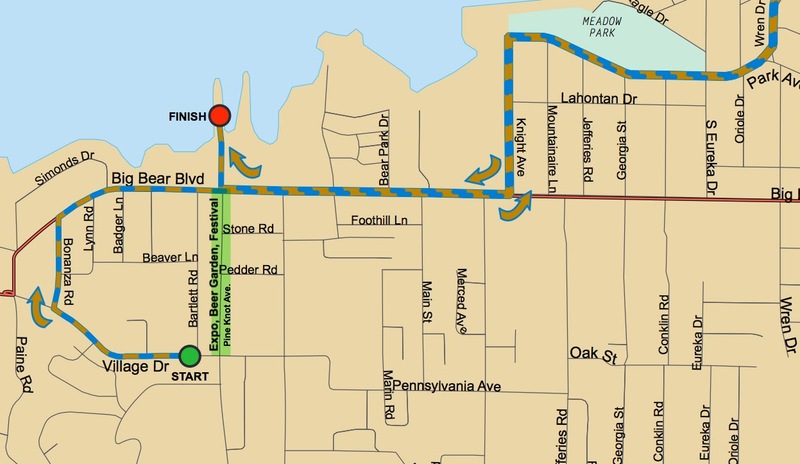 The first road closure begins May 14 with Pine Knot Avenue from Village Drive to Big Bear Boulevard closing at noon and remaining closed through the length of the event. From 5 a.m. to 6 p.m. road closures will take place on Village Drive, Pine Knot Avenue, Big Bear Boulevard between Paine Road and Knickerbocker Road, Bonanza Trail between Village Drive and Big Bear Boulevard, Bartlett Road, Badger Lane, Cottage Lane, Lynn Road, Croft Lane and Beaver Street. Pine Knot Avenue between Pine Knot Landing and Big Bear Boulevard will also be closed during this time along with the north side of Big Bear Boulevard between Knickerbocker Road and Knight Avenue. Roads affected by closure between 9 a.m. and 5 p.m. include Alden Road, Knight Avenue north of Big Bear Boulevard, Park Avenue between Knight Avenue and Swan Lane, Swan Lane and Fox Farm Road between Park Avenue and Sandalwood Drive, and Sandalwood Drive from Fox Farm Road to Big Bear Boulevard. 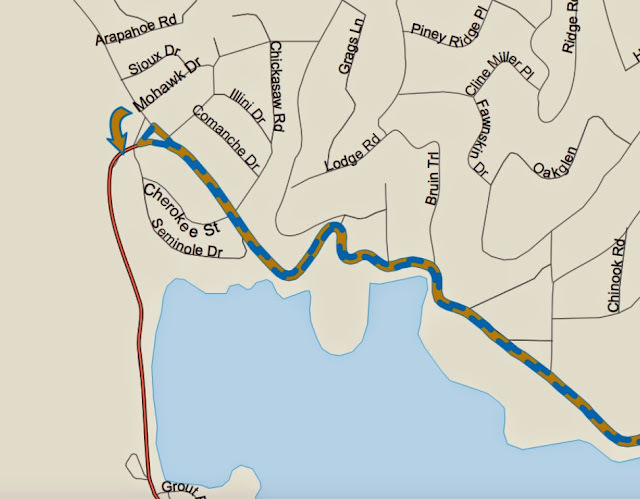 The north side of Big Bear Boulevard between Sandalwood Drive and Stanfield Cutoff is also closed during this time frame along with Stanfield Cutoff, North Shore Drive between Stanfield Cutoff and the Fawnskin Triangle, and North Shore Lane. Other related closures include the Big Bear Discovery Center and Bear Valley Unified School District. The Pine Knot Landing boat launch and the East Boat Launch will not be available on May 15. 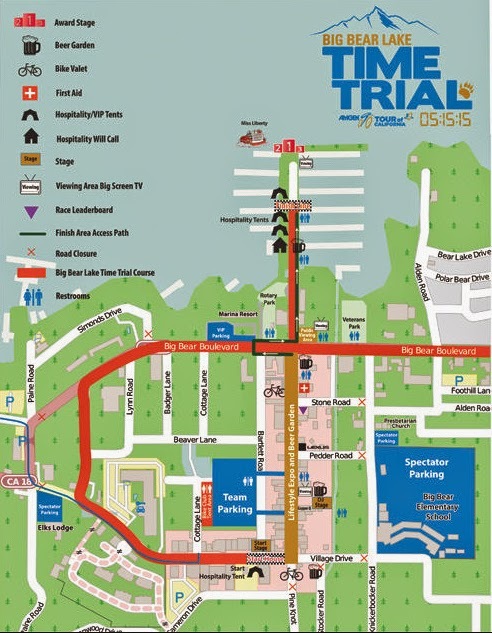 NBCSN will broadcast the time trial on Friday, May 15 at 2-4 p.m. PDT on NBCSN. Big Bear time Trial Access - these main roads highlighted in green will be fully closed. The racers will ride above and below the Serrano Campground. The individual riders will ride in team cars, or ride their bikes, to their hotels or will retreat inside their team buses immediately after their race. Once a rider races, he is whisked away to begin his recovery process for the next day - the tough climb up Mt. Baldy. For the women, this is their final day of racing. The Podium presentations takes place immediately after the finish of the race and only lasts about 20 minutes. If you can, make your way to the podium to see the celebration. The podium is at the end of the jetty. The traffic jam can wait.